This morning I ran out to check a red maple that a week ago had buds about to pop. They had popped, bright red against a vivid blue sky. Today was springlike weather, the perfect in-the-garden day. Alas, it was not to be. Sinus gunk and an achy-all-over feeling sent me inside to alternately putter around then wrap in a blanket and crash on the sofa with my laptop. As I moved photos from camera to computer, I wondered about the maple’s red blooms. I had seen the winged seeds in years past that helicopter around our yard and sprout multiple little trees in our flower beds. But I had never looked up-close at the blooms that precede the seeds. 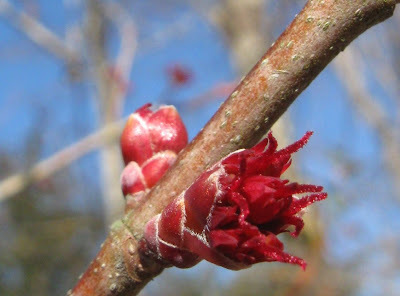 I Googled and learned that there can be red maples that are always male or always female, but most have both male and female flowers. Hmmm, I’ll be watching for where the winged seeds develop. Good medicine for my miseries was a welcomed visit from youngest son Jeremy, in town on business. Not only did he stop by, he brought pulled-pork sandwiches from The Shed, an award-winning Ocean Springs barbeque and blues enterprise. Evidently my appetite has not been affected. Husband Walter reminds me that spring has not sprung and won’t until the week after Easter. Weather Underground predicts weekend lows for our city at below freezing for Saturday and 34 degrees for Sunday. But today I relish the feeling that spring is on the way.